The Post of Chairperson of the National Human Rights Commission is most likely to be offered to Chief Justice of India H.L. Dattu, who is scheduled to retire on December 2. 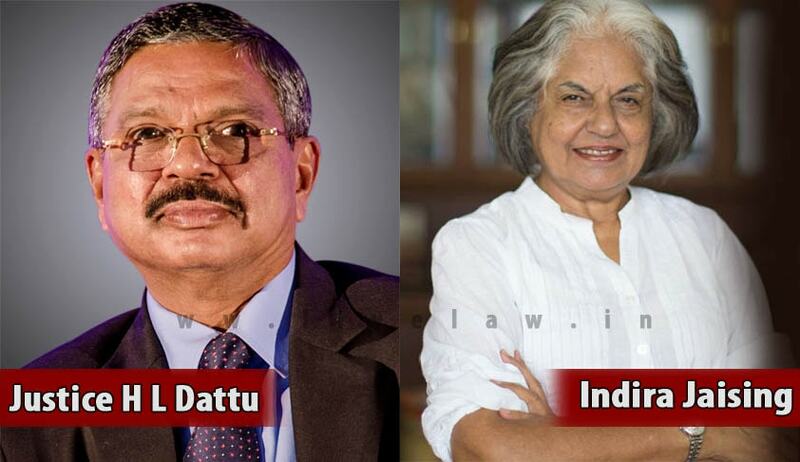 In an Email to LiveLaw, Senior Advocate and former Additional Solicitor General Ms. Indira Jaising stated that the news of the proposed appointment was “particularly disturbing” as it comes while he is still the Chief Justice. She further wrote, “The recently delivered NJAC Judgment places great emphasis on independent of the judiciary as a basic feature of the constitution. Independence can be undermined in different ways and one of them is offering post retirement benefits immediately upon retirement. There has to be a “cooling off” period as suggested by Justice Lodha, former CJI to avoid the impression that the offer is an attempt of bring undue influence while the Chief Justice is a sitting judge. Many have suggested that retiring judges should not give judgment in sensitive matters, to avoid the impression that they have been given in the hope of getting spot retirement benefits. Section 4 of Protection of Human Rights Act, 1993 provides the power of appointment of chairperson to the President, on recommendation of a committee comprising the Prime Minister, Lok Sabha Speaker, Union Home Minister, leaders of Opposition in Lok Sabha and Rajya Sabha, and Deputy Chairman of Rajya Sabha. At present, NHRC is being headed by retired Justice Cyriac Joseph, who is functioning as the acting chairperson. The post has been lying vacant since May 11 this year, when K.G. Balakrishnan demitted office after his five-year term. The CJIs currently eligible for the post are Justice S.H. Kapadia, Justice Altamas Kabir, Justice P. Sathasivam and Justice R.M. Lodha. Justice P. Sathasivam’s proposed appointment had witnessed opposition, with the National President of People’s Union for Civil Liberties writing to the President of India, asking him to refuse his appointment. The letter had opined that such an appointment, if made will make it look tainted and “will also affect the very integrity, credibility and authority of the institution meant to protect violation of the human rights of citizens.” You may read the petition and LiveLaw article here. All India Bar Association Chairman Adish C. Aggarwala had also filed a petition in the Supreme Court stating that the government’s move is ill advised and unethical. This was considering that when the BJP was in Opposition, it had repeatedly opposed post-retirement jobs for members of higher judiciary. You may read the petition and LiveLaw article here. In an interview to LiveLaw, Mr. Aggarwala had further enunciated his opposition to Justice Sathasivam’s appointment and said, “The news of his proposed appointment has appeared in different newspapers including Deccan Herald dated 26.3.2015. It was stated in the report that the Government has obtained his consent to become the Chairperson of NHRC. The Times of India dated 16.4.2015 also published the news regarding his consent. Neither Justice Sathasivam nor the Govt. of India denied the correctness of the said assertion about having sought his consent. It is an open secret that Ms. Rashmi Goel, Joint Secretary (Human Rights), Ministry of Home Affairs has spoken to Justice Sathasivam and Justice Sathasivam himself informed her that he is very keen to act as Chairperson of National Human Rights Commission as he is not happy with the post of Governor. Justice Sathasivam is also learnt to have told her that he has already requested the ‘higher-ups’ for the said position since it is a quasi-judicial post.” You may read full text of the interview here. The plea was later withdrawn, with the AIBA saying that its representation is being considered by the competent authority.